One of the “SQL smells” Phil Factor identifies in his article is the presence of “God Objects” in your Database or design. I agree with him, except that I would call them “very wide tables”. If you find them, then you may have a problem with the Conceptual Model you are using, or possibly t you should be considering using a different tool. In other words, you have a problem with your requirements. You have a “Requirements Smell”. How many columns make a “God Object” or wide table? 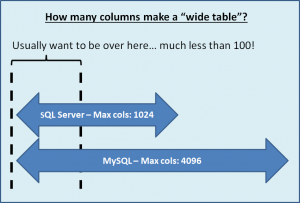 How many columns can you have in an SQL table? What the actual numbers are can depend on a lot of technical things. One hundred is still a big number. Database management software will handle wide tables up to their limits. As with most things, when you approach the limit you will start to encounter difficulties, but that is missing the point. Even 100 columns may indicate a problem. Why are “God Objects” or wide tables a problem? The reasons with “God Objects” or wide tables cause an SQL Smell are technical, practical and what you might term business, or even philosophical problems. I’m a Business Analyst, so I’m going to start from the “Conceptual” end, with the Requirements for the database, and then look at the problems which these tables may cause in Development and then when the system is in operation. Also remember, that if we eliminate problems at the conceptual end, then we’re not going to encounter them further on. Wide tables are most certainly a problem with starts at the “Conceptual Model” stage. Each row in a relational table is supposed to represent something. The “something” may be a concrete object in the real world, or it may be something abstract like a contract or a transaction. Would you be able to explain to the users of your system, or your business owners what a single row represents? If not, you are likely to encounter problems. Thinking about the columns in this wide table, each column is contains a value. How are you going to present or update those values? 1000 fields would make for a very busy screen. Even some sort of graphical representation is likely to be complex. Do your users really need to see all this data together? While there isn’t a rule which says that the whole of an entity has to be presented on a single screen, or as a single report, it has to represent something. Finally, every column in a row provides one value for one thing at one time. Is that really so in your wide table? “God objects” or wide tables encourage handling one big lump of data. That in turn is going to encourage the creation of complicated code. Maybe life would be easier for everyone if the data and the process descriptions were much more focused. If you are in an Analyst role, then think about how you are going to explain what should (and should not) be happening with all these columns. Remember, SQL tables have no concept of “grouping” of the columns. The columns have an order, but it is not something you should be relying on. If you can form columns into groups, then you should probably consider “normalizing” them into other tables. “God objects” or wide tables can cause problems when the system is being used. The volume of data each row contains may cause performance problems when rows are read from the table, when rows are updated and when new rows are created. Why do we get “God objects”? 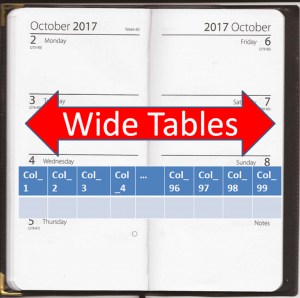 Wide tables often start from trying to convert large and complex paper forms or spreadsheets straight into table designs. It seems like a good idea at first, but it can get bogged down in unexpected complexity. Think about your least favourite paper form, especially if it runs to several pages – maybe it’s a tax return or something similar. Obviously the physical form represents something. If you were specifying a system to work with it, then you would be tempted to have a single table where each row represented a single form, there was a column for every question and each cell contained one person’s answer to a question. It would be just like an enormous spreadsheet. Some early commercial computer systems were like that. They worked but they were inflexible. One clue that something is going wrong (apart from the number of columns) is the number of columns which need to allow “NULL” values. How many times does “Not Applicable” appear when you are filling in the paper form? How do we solve the problem of the wide table? The answer is to think about what all these columns mean and then start applying Data Modelling or normalization techniques to break the data into more manageable and useable chunks. If you can from groups of columns then those groups may be candidate entities and therefore candidate tables. If you need to use the order of similar columns then maybe you should be considering a different table design like the “Entity Attribute Value” (MVP) Pattern. But beware, because that can give rise to a bad smell too! Nothing in Information Technology is ever clear-cut. There are usually grey areas. One person may regard a table as too wide and another may regard it as OK. There is always room for some discussion. There are times when using a table that is a little wider than we would normally like is acceptable. Here are some of the reasons (or maybe that should be excuses) that you may here for wide tables. It gets all the work done in one place, so that other programs can use the data. I don’t really buy this one. I suspect that someone is guessing what these other programs need. If the guess is wrong then someone is going to have to re-design the big, wide table. I continue to maintain that having discrete data and performing discrete actions is better. Here is a specific case I found where someone wanted to retrieve data from 2000 sensors. This is a case where using something other than a relational database might be better in the first instance. Depending on the details it might also be a case where using the Entity Attribute Value (EAV) model is appropriate as well. We are being given the data in the wide form from another system. This excuse I will accept, because it is really being imposed as an external requirement. But! If you need to do this, then you will need to do the work of working out what all those many columns mean, and you may have to break the wide row down into constituent parts. That’s addressed the “God Object” or “Wide table” smell. I’ve already mentioned the “Entity Attribute Value” (EAV) model a couple of times. I’m going to address why that may be give rise to a bad smell in the next post. Previous Previous post: Requirements Smells make SQL Smells! Next Next post: Do “Entity Attribute Value” (EAV) Models smell bad?